Pilates is a unique system of body conditioning that stretches and strengthens the muscles, as well as improving flexibility, balance, breathing, posture, and alignment. Pilates targets the deep postural muscles of the abdomen and spine to improve overall central core stability and posture. It also encourages you to focus your mind as you exercise the body, gradually improving your general body awareness, co-ordination, and overall alignment. 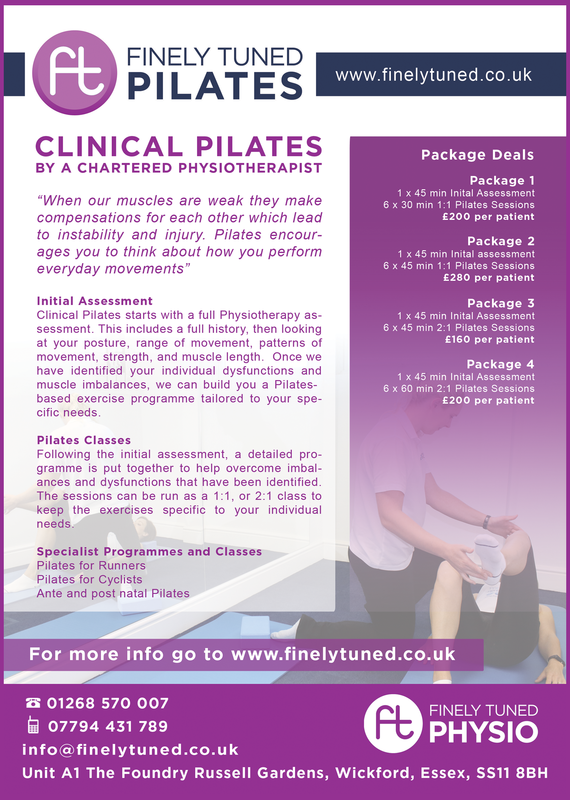 Clinical Pilates starts with a full Physiotherapy assessment. This includes a full history, then looking at your posture, range of movement, patterns of movement, strength, and muscle length. Once we have identified your individual dysfunctions and muscle imbalances, we can build you a Pilates-based exercise programme tailored to your specific needs. Following the initial assessment, a detailed programme is put together to help overcome imbalances and dysfunctions that have been identified. The sessions can be run as a 1:1, or 2:1 class to keep the exercises specific to your individual needs.